This envelope design is becoming common. 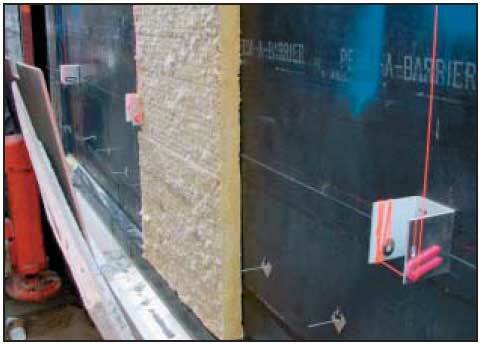 An air and water membrane is applied over a solid substrate, (concrete, CMU, sheathing). 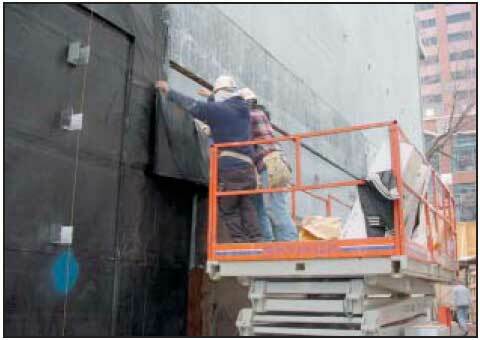 Then insulation is applied over the membrane. Superl has applied this system on several projects, and has the knowledge and expertise required to install these systems and all related appurtenances correctly. This includes conditioners, primers, termination bars, flashing, etc. 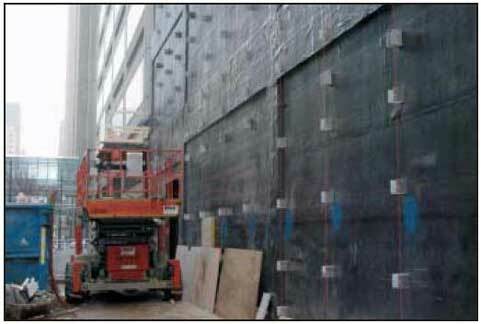 (Above) Membrane being applied over substrate. The membrane functions as an air, water and vapor barrier. This is a critical primary line of defense against air and water infiltration and interior vapor migration. (Above) Membrane completely installed. Ready for insulation. All necessary bridging strips, membrane flashing and seals are part of this application. These areas are inspected and “signed off” prior to the insulation application. Struts for stone cladding are anchored after the membrane is applied. (Above) Insulation starting to be installed over the membrane. Coordination with other trades is critical. Pins for the insulation are anchored after the membrane application.